The band is selling "In Rainbows" through its Web site at a very attractive price -- whatever you want to pay. Radiohead's new album hasn't been much of a secret. For more than a year, the band has been playing several new tracks at concerts, and if you're an astute YouTuber you can build a fine playlist of these to ring in that precise and complicated malaise that only Thom Yorke and his public school fellows can manage. Whether any of the new songs would ever be released was another story. Radiohead completed their contract with the EMI label with their last album, "Hail to the Thief," and since then have not kept their antipathy toward record companies very secret. In this clip a fan pleads, "Tell us about the new album!" Yorke answers, "Who says there's an album?" And when the New York Times asked him about it last year, Yorke drew a picture of a band deeply disillusioned with the state of the music industry today. "We were having endless debates, spending entire afternoons talking about, 'Well, if we do something, how do we put it out?' ... It just became this endless and pointless discussion. Because in our dreams, it would be really nice to just let off this enormous stink bomb in the industry." So that's what they did. This weekend the band announced that its new album, called "In Rainbows," will go on sale on Oct. 10. They still haven't signed with a label, and the album won't be available in record stores nor on iTunes or any other online music shop. You'll find it only on the band's site, and if you're looking for a digital version, the price is very attractive: Whatever you'd like to pay. You can pre-order the new album here. Click to purchase the download and you're presented with a simple screen at which you've got two boxes to fill in, quantity and price (in pounds). 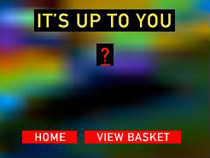 "It's up to you," the site says. If you'd like something physical, the band is also selling "In Rainbows" in something it calls a "discbox," a beautiful package that includes a CD, two vinyl records, digital files, album artwork, and lyrics booklets. It sells for 40 pounds, about $81 (the price includes shipping anywhere in the world). If you've got a Radiohead superfan in the family -- and who among us doesn't? -- your holiday shopping just got easier. How smelly of a stink bomb is Radiohead's move, record industry-wise? The band is a powerhouse; though they're the most adventurous rock group working today, Radiohead manages to keep a supremely loyal fanbase, and their albums consistently sell well. Any label would have swooned for it -- though, as ever, only on terms unfair to the artists. For every $1 song sold on iTunes, according to reports, Apple keeps about 30 cents, giving about 70 to the record label. But activists say artists typically get just 8 to 14 cents per song from the deal -- or about $0.80 to $1.40 per album sold digitally. So that's the main test here; in order for the band to come out ahead, Radiohead needs to clear only more than a buck-50 per sale. Easy. The move, if it works, could set a terrible precedent for the recording industry. Radiohead's not the first big act to sell its wares by itself -- Prince comes to mind -- but their fan base is the sort that sleeps with Macs; they know how to buy stuff online and don't mind rewarding a band that's made their lives so beautifully miserable for so long. If the labels aren't careful, other acts will catch on soon. Update: As King Kaufman rightly notes, $1.50 is only break-even if Radiohead sells as many copies this way as it would have going the traditional route. I think it's plausible -- and even likely -- that the band will sell roughly the same volume as it has on previous albums (a bold claim considering I've only heard live bootlegs). King disagrees with me; he points out that if selling the same volume at better profits was that easy, many big acts would be fleeing the labels, and that's not happening. But that's precisely why this could be a big deal. Let's check back a year from now; maybe the story's different then. I've also updated this post here with track listings and links to clips of song on the new album, and news that a CD might also make it to stores. P.S. If you buy a copy, do tell me how much you chose to pay in the comments below.